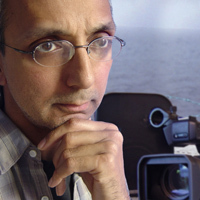 Kuljit ‘Kooj’ Chuhan is a video and digital media artist, film maker and teacher, equally involved in cultural development, museums, communities and project management. He is also founding director of the Virtual Migrants artists group currently connecting issues of race, migration and climate change. His own work has been shown in the USA, France, India, Brazil, Mexico and across the UK, and he has given talks and chaired discussions in a wide variety of settings and geographies. Kooj has moved towards an artistic approach which allows the source of grass roots experience to not only drive the art from the ‘bottom’, but also which involves the people in a cultural process of collaborative artistic production. Kooj works as a film maker, digital media artist and cultural producer who cuts across artistic practice and teaching; cultural development; as a creative producer; a collaborative audio-visual project consultant for museums; and education, curriculum and learning development. In addition to his significant professional standing including work with artists such as Keith Piper, Kooj has extensively worked with various communities and was recently a senior manager at Community Arts North West. As a media artist he intends to progress artistic, cultural, social and historical issues from migrant perspectives in relation to global and local contexts. Personal artistic approaches include blurring the interface between documentary, fiction and reality; non-linear narratives and interactivity; and post-colonial cultural development. He lectures in contemporary film (directing, music, theory) at Manchester Metropolitan University and has been exhibited and published across the UK and internationally, featuring at festivals such as VIDEO POSITIVE, ISEA and SIGGRAPH. He served on the board for FACT (Foundation for Arts & Creative Technology) from 1998-2003. Kooj has founded and run a number of groups and organisations such as the Virtual Migrants artists collective focusing on race, migration and globalisation. For a number of years Kooj has been working with museums either as an artist, producer or cultural consultant. He pioneered the “Collective Conversations” methodology at the Manchester Museum which facilitates dialogues and co-production with communities of interest; and worked with a partnership of eight museums and galleries on a major project about Manchester’s links with transatlantic slavery. He is currently a consultant for the Paul Hamlyn Foundation’s Our Museum programme across 9 UK museums. He advocates education in its broadest sense and has worked as a teacher in a range of environments both formal and informal. Kooj has also previously worked as a scientist, a community worker, and as a professional musician.